The subjects of corporate personhood, corporate purpose, and fiduciary duties are all central to corporate law discourse. But what is the relationship of each of these to the others? This chapter describes how corporate personhood, corporate purpose, and fiduciary duties are vitally and coherently connected. While longstanding debates about the theoretical nature of corporateness likely will continue, corporations are meaningful socio-legal entities separate and distinct from those persons associated with them. With respect to corporate purpose, the objective or “mission” of a business company is to provide goods or services in a particular manner, goals that may in part be non-monetary in nature and that are not necessarily the ultimate aims or motives of all individuals choosing to associate with a corporation. Moreover, corporate law generally is agnostic and broadly permissive as to a company’s goals, and shareholder well-being is better understood as an outcome of corporate success, not necessarily the very point of business enterprise. Taking these considerations together, corporations as distinct entities can and do have purposes separate and apart from those of its shareholders and other constituencies who choose, so to speak, to submit voluntarily to the jurisdiction of the corporation. This is an important characteristic of a burgeoning institutional pluralism not just in the business sector, but in modern society more generally, as different organizations pursue, to varying degrees, different entity-specific objectives. Part 3 introduces fiduciary duties into this picture, arguing that corporate boards of directors collectively have the statutory governance responsibility, and corporate directors individually have the fiduciary duty, to act in the best interests of the corporate entity, which is to say, to act to advance the purposes of the corporation, whatever they might be. Thus, stated most strongly, the directorial fiduciary duty of loyalty is to act in the best interests of the corporation (a distinct person) by affirmatively advancing the articulated corporate purpose(s). 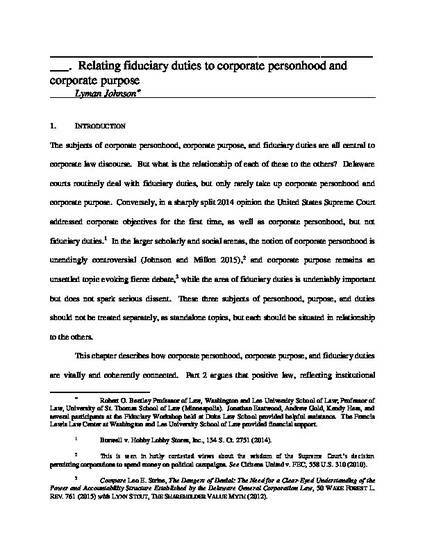 But to fully explain the policy of strong judicial deference to director prerogative and discretion in charting corporate direction, and the empirical reality that remedial relief is rare even in the face of director failure to fulfill duty - that is, failure to devotedly advance corporate purpose - a weaker version of loyalty is judicially demanded, i.e., nonbetrayal of the corporation’s institutional interests and purpose, not their fully faithful attainment. In this way, corporate law discourse can express a strong coherent demand that directors loyally serve the private corporation’s distinctive purposes even as public courts, institutionally, can only enforce a weaker demand that directors not betray those interests. D. Gordon Smith & Andrew Gold, eds. This is a pre-publication version of this work. Please contact the author before citing.